If you, as a schoolboy, buy a pipe – it has to be a quality pipe, so it must be stamped ”real briar” – it may lead to that you become a pipemaker. And if you have a five year younger brother, who with admiration is watching all his big brother is doing, then you and your brother may become a pipemaker team. Well, it was not exactly like that when Vollmer & Nilsson started making pipes, but it is true that big brother Anders bought a “real briar” as a schoolboy, and certainly Martin, his younger brother, was watching everything he was doing. But at that time, the two brothers had no plans to make their own pipes. Having finished his studies Anders started to work in a laboratory, and Martin went to the university to study theology. The interest to make pipes was awoken for the two brothers Anders Nilsson and Martin Vollmer at a visit to Copenhagen. There they found a book, Pibemagerens Håndbog (The Pipemaker’s Handbook), written by the Danish pipemaker Bjørn Thurmann. This book tells how to make a pipe from a pre-drilled block, and Anders and Martin immediately started at the kitchen table at home. In that way they learned the basics. But they soon realised that to make really good pipes, they had to make them right from the beginning - drill the blocks themselves and make the stems from a rod of ebonite. So they had to find out how to do this, and as both Anders and Martin likes to experiment and to find functional methods to solve all types of problems, there was a lot of experimentation. But, the kitchen table is a good place for many things, but it can not house too many lathes and other big machines. About three years ago, Anders and Martin were offered suitable premises for a workshop, and that offer came at a very convenient time for both brothers. Martin thought he had been studying theology long enough (he had since long abandoned any plans to become a clergyman), and due to rationalising and changes in the organisation at Anders work, he too felt ready trying something else. Could it be possible to make a living making pipes? Or is it a too funny way? Well, it may be worth a try. Anders and Martin were aware of, that the pipes had to be technically perfect if they should have a chance to succeed. 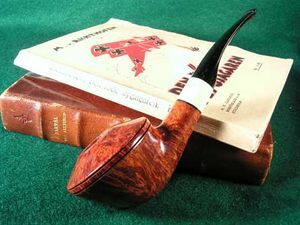 And they had to find good material (above all briar) and a style of their own, a style they really liked themselves - hopefully other pipesmokers would like it as well. Martin had for many years been collecting pipes, and in his collection were three pipes made by the very best pipemakers: Sixten Ivarsson, Bo Nordh and Björn Bengtsson. The pipes were carefully examined and the destination was set – all details should be as perfect as on those three pipes. The two brothers started to build a workshop, and the speed in the process was set by the economy. They did not want to take any loans; it was better waiting until they had got the money. 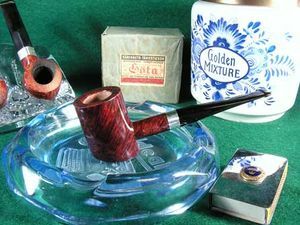 It may sometimes feel frustrating not being able to buy equipment as fast as you want – you are of course anxious to start making pipes - but there may also be some advantages. In that way you get time to test every single machine thoroughly, and you can make the changes you think necessary. And if you are trying to keep the costs down, you have to be creative and find less expensive solutions. Anders and Martin have proven a great ability there. It was a great surprise to me when I got a mail, in which Anders Nilsson and Martin Vollmer invited me to visit their new workshop for pipes. 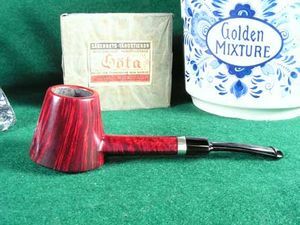 A new pipemaker in our country is extremely unusual, so to say that I was surprised may be an understatement. And the mail told me that they had been making pipes for three years! Maybe I had taken it for a joke, if they had not sent some pictures of their pipes. I was indeed impressed by the pipes in those pictures. Making pipes for three years and not tell anyone about it; that tells us about the extremely high demands Anders and Martin put on themselves. They wanted to be perfectly satisfied with the pipes they made, before anyone was allowed to see them. Of course I immediately accepted the invitation, and together with the pipemaker Bengt Carlson I visited the two brothers in Malmö in September 2004. When Anders and Martin showed us into their workshop, it was easy to see how proud they were of it. And they had reasons to be proud. The workshop is well-organized and comfortable, and the machinery tells a lot about their ingenuity. Making pipes is something they really like, you can not be mistaken there. They have a sandblasting machine in the workshop, which is quite unusual among pipemakers. It makes a lot of noise, Martin (who makes most of the sandblasting) tells us, and it is slow; it takes about an hour to blast a pipe. “And I have to stop every five minutes to clean the filter”, Martin tells us. But that is not entirely wrong either; then you can examine the pipe and see, where you have to take some more and where you have to be extra careful. And if you have fun, it does not matter if it takes some time. During the three years of learning they have also learned how to work in silver. Anders is doing most of that, and they have registered a hallmark of their own. Besides silver, they like to use other types of wood for decoration; they also use horn and a type of half synthetic material that looks like a precious stone. Bamboo has not yet been used, because they had not found any of a sufficient quality – a problem they share with many other pipemakers. Bamboo is indeed in very short supply to-day. Most stems are made from ebonite, but also cumberland is sometimes used. Vollmer & Nilsson is a long name, and long names are hard to stamp with a traditional stamp. When I saw how sharp and clear the stamps were, I thought they had special equipment for that. But it is not so, they use an ordinary, conventional stamp, but - as with so much else - they have found some tricks to help them to a good result. I can not tell exactly how they do it, but on some forms of the shank they use the stationary drilling machine, on other forms the lathe to get enough pressure. Anyway, the result is excellent, but they admit that it is a nervous task to stamp a pipe. Two pipemakers working together like this is unusual, very unusual. There is only one example I am aware of, and that is the S. Bang workshop. If you buy a Bang pipe you do not know who made it, Per Hansen or Ulf Noltensmeier, and it is exactly the same with a pipe stamped Vollmer & Nilsson. In some cases it may even be both of them. 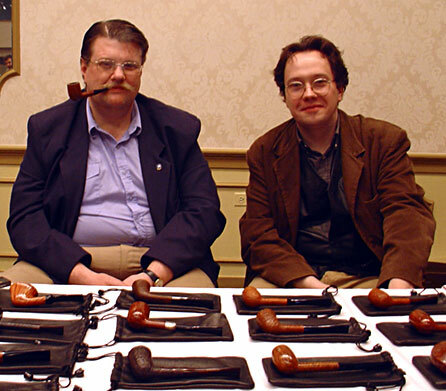 As you can see from the pictures, both Anders and Martin are very fond of the classical shapes, and some of their pipes are directly classical, others some variations on that theme. They like to be inspired by pictures showing old pipes, preferably pipes made in the beginning of the last century. Most of the “ebauchons” are bought from Tom Eltang, but as he at the moment has difficulties to find enough briar to sell to other pipemakers, they at our visit had some briar on its way from Italy. The pipes Anders and Martin make may be smooth, sandblasted or rusticated. Most pipes are left natural in the tobacco hole – something that I personally prefer, even if I know it is a controversial subject. The handiwork is excellent and they estimate that it takes about two days to make a pipe. I wish Anders and Martin all the best for the future, and I feel sure there will be opportunities to write more about them later on. To call us, please dial the access code from you country followed by the number above. Please click here to check our local time before you call us - thanks. This page was last edited on 7 June 2015, at 13:29.